This document provides important background information which should be reviewed before enrolling in the course. In particular, potential participants should ensure they are eligible to enrol in the PMP or CAPM certification exam. The examination for the PMI PMP and CAPM credentials covers a defined knowledge base outlined in the PMP Exam Specification, not just The PMBOK® Guide (although this is the basis of the qualification / exam). The Exam Prep course covers the full spectrum of project management knowledge needed to succeed in the PMP/CAPM exams, and is supported by online practice examinations to help participants prepare thoroughly for what is a demanding exam. Students will acquire the necessary knowledge and understanding required to successfully pass their PMP/CAPM examination. Our PMP/CAPM exam prep course is specifically designed to equip trainees with the necessary skills and knowledge to pass a difficult, multi-choice examination. Most people also acquire significant useful project management knowledge to apply in the workplace. The course framework is based on The PMBOK Guide (5th edition), key references from the PMI list of recommended reading materials and the student’s own pre-existing knowledge and experience. Provide a structured framework to test trainees’ knowledge on a progressive basis against PMP examination standards – you will answer hundreds of exam style questions! Course material has been developed in conjunction with the Valense/Palatine Group, who are a Charter member of PMI’s Registered Education Provider (R.E.P.) program (REP ID 2094). Course presenter Jürgen Oschadleus has been a PMI member since 1998, and has held the PMP credential since 2006. He has served on the PMI Sydney Chapter Board, as well as on PMI’s R.E.P. Member Advisory Board. Applications for the PMP and CAPM examination should be made either ‘on-line’ via the PMI web site at http://www.pmi.org and follow the links from the “Certification” / “Apply Now” link (RECOMMENDED) – or via the paper-based application included in The PMP Handbook or The CAPM Handbook. All examination fees are charged in US Dollars; cheques and money orders must be payable against an American bank. All major credit cards are accepted. This fee is independent of any exam preparation class fees you incur. The cost of joining PMI is US$119.00 plus US$10.00 joining fee (total US$129). Therefore for PMP candidates in particular, joining PMI first (using the on-line registration) will save you money – and you will receive all of the other benefits and discounts available to members. Membership of PMI Components, including local Chapters, Special Interest Groups (e.g. The PMO-SIG or IT&T-SIG) and Colleges are an additional fee above the base membership. For PMI Membership details go to www.pmi.org and follow the links to “Become a member” under the “Membership” menu. Step 1: ApplicationThe first step in the application process requires completing the on-line (or paper based*) application form. This does not have to be undertaken in a single sitting; you are able to save the application and return to it at a later date. Incomplete applications are deleted after 90 days. *The processing sequence for paper based application is different, payment should be included with your application. After making your payment, your application will either be randomly selected for PMI’s Audit process or you will receive your examination scheduling instructions. Audit selection. PMI audits a significant percentage of Certification applications; most audits are selected randomly but PMI also reserves the right to manually select specific applications for audit. It’s best to assume that your application will be audited. During the audit process, PMI requires formal verification of all information you have provided, from your nominated employer(s), project referees, and training organisations and educational institutions. This is a very formal process designed to maintain quality in the Certification Program. If incorrect information is found during the audit process, you will have your Certification or eligibility revoked. Instant audit notification. Applicants selected for audit will be notified electronically. Automated follow-up reminder notifications will be issued to candidates electronically throughout the audit process. On successful completion of the audit your examination number is issued. After receiving your email advising your candidate details, scheduling your examination is straightforward. All eligible candidates can quickly and easily schedule, cancel and reschedule** their certification examinations on-line at www.prometric.com/PMI/default.htm. Prometric are responsible for the delivery of all PMI examinations worldwide. You choose the centre, date and time of the examination to suit your requirements, subject to availability. The minimum lead time needed to book a CBT after receipt of your examination number is around 1 week. Fiji does not currently have an online examination site (see Paper Based Test below). The closest sites would be Brisbane, Sydney or Auckland. Following registration, candidates must take their examination within the twelve-month eligibility period, starting on the day on which the application is approved. One extension (or a refund) is possible but costs and conditions apply (details are contained in the relevant Certification Handbook). Please note: it is critical that your name used in the application process exactly matches on the government-issued identification that you will be presenting to access the testing centre. Address variations on your government issued ID do not matter, only the name. ** Conditions and fees apply to cancelations and rescheduling within 30 days of your selected date. Consider using the Prometric Test Drive to experience a real world, end-to-end practice run through the system before the date of your scheduled test. We recommend using the on-line application process, the forms in the handbook provide a useful reference before making your application. IF there is any conflict between the summary information contained on this page and the detailed information contained on the PMI web site, the PMI information takes precedence. This information is provided to assist PMI examination candidates and PMPs to understand their obligations, it is not necessarily up to date or accurate. 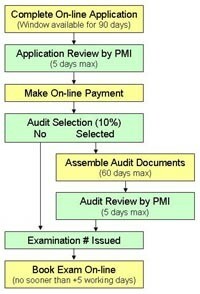 All PMP forms are copyright of PMI. PMI offers paper based exams (PBT) in many locations where access to a computer-based testing (CBT) centre is not possible, and/or for in-house exams. Exam fees and lead times for booking into PBT exams are different – you MUST select the PBT option at the start of the booking process to access the PBT system and the lower fees. At least ten people are required to complete the PBT exam. For more information, see The PBT Handbook. Given that Fiji does not currently offer an online Prometric test centre, two PBT dates will be arranged for Suva in 2015. Specific dates and application process to be determined.